Office 365 is the evolution of Microsoft’s productivity suite. It unites the legendary Office software package 20 Historical Microsoft Office Facts You Forgot Or Never Knew 20 Historical Microsoft Office Facts You Forgot Or Never Knew The Microsoft Office suite turned 25 this year. The world has changed since digital presentations, word processing, and spreadsheets became a thing. Do you remember how it all began? Read More with an attractive online suite. This product lets you create a document in Microsoft Word, sync it to OneDrive, and open that same document in Word Online in any web browser. Right now, no other office suite offers the same online and offline integration. It’s what makes Office 365 worth its subscription price An Introduction to Office 365: Should You Buy Into the New Office Business Model? An Introduction to Office 365: Should You Buy Into the New Office Business Model? Office 365 is a subscription based package that offers access to the latest desktop Office suite, Office Online, cloud storage, and premium mobile apps. Does Office 365 provide enough value to be worth the money? Read More of $100 per year. Plus, given its advanced features, it’s indispensable for professionals worldwide. 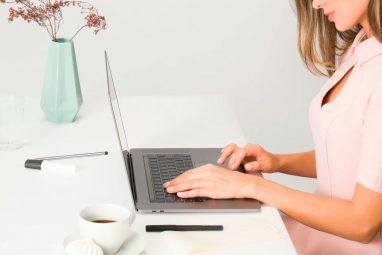 If you want to step out of Microsoft’s shadow, however, or simply don’t want to pay, you can choose from excellent free and low-cost offline alternatives to Office. Here’s we’ll have a look at the online alternatives for Office 365. If you’re comparing Microsoft Office Online with Google’s online office suite, there’s plenty in Google’s favor. For example, unique features like using your voice to type! 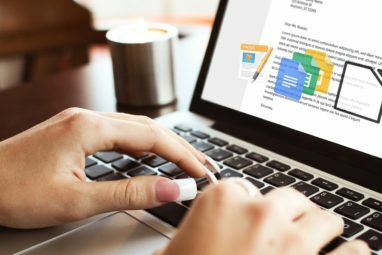 Moreover, Google Docs is better than Microsoft Word for research writing Google Docs vs. Microsoft Word: The Death Match for Research Writing Google Docs vs. Microsoft Word: The Death Match for Research Writing Online solutions are becoming the norm. We decided to see how Microsoft Word stacks up against Google Docs. Which one will do the better research paper? Read More . But Microsoft Excel remains the king of spreadsheet software, despite Sheet’s “Explore” feature. Slides and PowerPoint are neck-and-neck to create presentations. So the decision to use Google or Microsoft is about what you use more: word processing or spreadsheets, respectively. That said, Google’s office suite doesn’t work well without the internet. While you can technically use Google Docs offline How to Use Google Docs or Drive Offline on PC & Mobile How to Use Google Docs or Drive Offline on PC & Mobile The downside to cloud-based services and apps is that you always need to be online to use them. We show you how to take Google Drive offline & what to keep in mind. Read More by installing Google Drive, it’s clunky software. Actually, you can have the best of both worlds. You can use Microsoft Office when without the internet, and go online with those files in Google Docs. It’s all possible with the official Google Drive plug-in for Microsoft Office This Easy Plugin Integrates Google Drive Into Microsoft Office This Easy Plugin Integrates Google Drive Into Microsoft Office Wish you could access Google Drive from right inside Microsoft Office? Here's a quick plugin that makes that possible. Read More . The one problem is that Google Drive will actively convert the files to Google’s own formats. The changes are minute, but it’s an inconvenience nonetheless. Open365 is the new darling of the tech world. It’s based on the excellent LibreOffice, a free open-source Micorosft Office alternative Is the New LibreOffice a Better Microsoft Office Alternative? Is the New LibreOffice a Better Microsoft Office Alternative? LibreOffice, a long-time contender of Microsoft Office, just received a makeover and important updates. After being held back by niggling bugs over the years, has LibreOffice finally found the winning formula? Read More . And using Open365 is like using LibreOffice in a web browser. Since Open365 is basically the full program running in the cloud, you get a lot more than what any other online office suite offers. Microsoft’s Office Online has stripped some features from its full-fledged offline suite. You won’t have any such problems with Open365 and LibreOffice. The only gripe with Open365 is the lack of a simple plug-in for LibreOffice to sync files. In fact, there’s a separate Open365 sync client. The seamless marriage that Microsoft creates with Office 365 is missing here. And that’s actually a big problem. In terms of convenience for everyday usage, Office 365 and even Google Drive seem better options at the moment. Note: Open365 says it is in beta, and the beta will close on October 31, 2016. At the time of writing this article, even though it was well past the date, Open365 was working perfectly. Zoho is the most polished interface among all the online office suites. The company has been around for over a decade and predates both Google Docs and Office Online. It’s no wonder that they make some of the best-looking products. Zoho impressed us with their most recent offering. 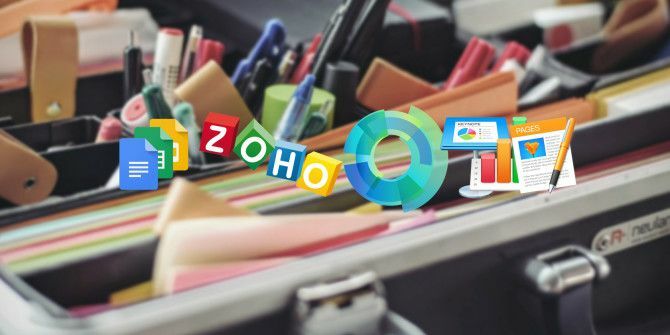 Zoho Writer is as good as or better than Google Docs and Word Online Zoho Writer vs. Google Docs & Microsoft Word Online: Is It Time to Switch? Zoho Writer vs. Google Docs & Microsoft Word Online: Is It Time to Switch? If you're not completely satisfied with Office Online or Google Drive, try this free online word processor: Zoho Writer 4.0 comes with a clutter-free interface optimized for widescreen monitors. Read More . Zoho’s spreadsheets (Reports) and presentations (Show) apps also include most features any user would want. We actually reckon Zoho Show is among the best free PowerPoint alternatives 7 Free PowerPoint Alternatives for All Your Presentation Needs 7 Free PowerPoint Alternatives for All Your Presentation Needs Microsoft PowerPoint is a fantastic tool, but you might need a free alternative. We have compiled the best presentation tools, just keep in mind that none of them are as good as the original. Read More . Plus, Zoho is completely free for groups of up to 25 people, which makes it an attractive option for small offices and teams. It also focuses on collaboration, with emphasis on chats, simultaneous editing, and other team-based features. If you want to stop giving information to Google Android Users: How to Stop Giving so Much Personal Information to Google Android Users: How to Stop Giving so Much Personal Information to Google Android users, by default, give Google a lot of information. Here's how to get out of that trap. Read More , Zoho Office is perhaps your best option. Finally, Zoho is completely compatible with Microsoft Office files, unlike Google Docs and Open365. One of Apple’s best-kept secrets is that its iWork suite of office apps is now available for free to anyone in the world. You don’t need to own an Apple device. All you need is an Apple ID. And we already know that anyone can create an Apple ID. Now, this cloud-based software is going to work best on a Mac with iWork How the New iWork for iCloud Works With Your Apple Devices How the New iWork for iCloud Works With Your Apple Devices iWork for iCloud is a suite of online office applications (consisting of Pages, Keynote, and Numbers) that sync with the Mac and iOS versions of the programs. The online versions of iWork mirror most of... Read More installed on it. But the good news is that it doesn’t skimp on any features in the browser version. So you can use Pages, Numbers, and Apple’s famed Keynote, which Steve Jobs made his famous presentations with. The biggest thing going for iWork 5 Reasons You Should Use iWork Instead of Microsoft Office 5 Reasons You Should Use iWork Instead of Microsoft Office Many long-time Office users will be unwilling to transition away from the apps they're so used to working with, but it's time to give iWork another chance. Read More is how well it works with Microsoft Office files. The formatting stays intact, and Apple’s fonts actually make the whole thing look better. All that said, iWork is only good for basic office suite uses. If you create complicated Excel spreadsheets or want to write a paper for school that requires plenty of research, you’re better off with one of the other alternatives here. All said and done, let’s not forget that with the online suite, you can use Microsoft Office without paying for it 6 Ways You Can Use Microsoft Office Without Paying for It 6 Ways You Can Use Microsoft Office Without Paying for It Do you need Microsoft Office but don't like the price tag? Here are some ways you can use Microsoft Office for free! Read More . That’s a big plus. Plus, some students can get Office 365 for free Students Can Get Microsoft Office 365 for Free Students Can Get Microsoft Office 365 for Free Starting on December 1st, Universities that license Office Education for their faculty and staff can offer students Office 365 ProPlus for free. Read More . And there are other ways to get a discount on the suite. 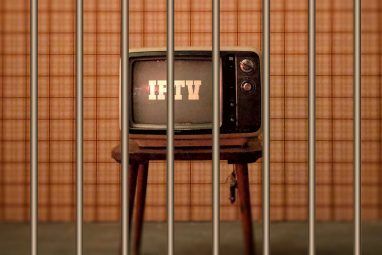 You might want to look into that instead of these alternatives. But if you are done with Microsoft Office, we’re curious. Which software did you jump ship to, and why? Explore more about: Google Docs, Google Sheets, iCloud, iWork, Microsoft Office 365, Microsoft Office Alternative, Microsoft Office Online. Honestly, there are lots of better and cheaper (and free as well) alternatives to Office 365. And it’s not Google Docs only. Just to mention iWork which is absolutely free and lots of other Office 365 alternatives. Here https://5best.cloud/office-365-alternatives/ are some insights and comparisons on what you get with Office 365 and other cloud office tools. The alternative to Microsoft office 365 I find most useful is Brosix. It allows you to communicate freely and securely within your network. Also a full package of features is included such as video calls,whiteboards,screen-sharing, etc. You should definitely consider if you are looking for an alternative. I am using libre office on my new computer build. I have ms office on another computer that was student version and I don't know if I can transfer it to new computer. I no longer have a student resident. If you're no longer a student, you won't be able to transfer it.